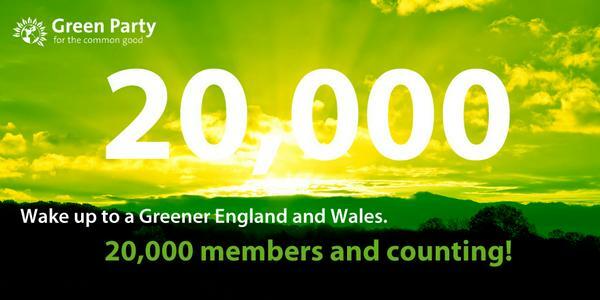 The Green Party of England and Wales’ membership has grown by over 45% in 2014 alone. This means that, for the first time in the party’s history, their membership is over 20,000. The youth branch of the Green Party, the ‘Young Greens’, has seen a particularly spectacular increase in membership with over 100% new members joining since March 2014 alone. This coincides with what Hynd’s Blog reported in September that support for the Green Party amongst 18-24 year old voters had doubled since May’ elections. That ‘doubling in support’ fact came from consistent YouGov polling that found 10-11% of 18-24 year olds are planning to vote Green in May 2015. Interestingly the last three YouGov polling data sets have shown that this increase has, if anything, increased. In the polling from the 29th/30th September the Green Party picked up 11% of 18-24 year old votes, from the 30th September/1st October 13%, and from the most recent 1st/2nd October 14%. There is also good news for democracy hidden amongst this milestone for the Greens as well. At the 2015 General Elections Greens will be standing candidates in over 75% of seats – that is an increase of 50% from 2010. This is important for democracy to ensure that voters, who would want to vote Green, have that option on the ballot paper. Greens are cheerfully referring to this surge in the polls and membership combined with beating the Lib Dems in May’s elections as the #GreenSurge. It will be interesting to see if this surge runs its course like a wave moving up a beach, or, whether these are the foundations for the Green Party moving into contention within mainstream British politics.